We are pleased thrilled to introduce Concentrate™, an innovative long-tail keyword tool. Concentrate is for SEO and paid search professionals who want to make sense of search keyword data and make the most of search investments. Check out the demo here. Or try out the free version here (you’ll need admin access to a Google Analytics account). We built Concentrate because we saw a fundamental conflict in the world of search analysis: On the one hand, search keyword data is terrifically interesting and valuable. It can tell you what your visitors and customers want and how they think about you and your products. Unfortunately, search query data is also big, messy, and hard to get your hands around. In a typical month, the Juice site gets over 10,000 visits from over 7,000 unique keywords. 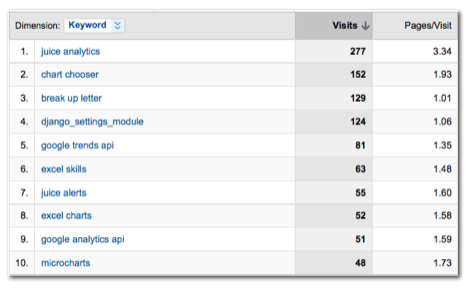 Even if I could somehow wrap my head around our top 100 keywords, I’d only understand 25% of the visits. For people spending money on search engine optimization or paid search campaigns, that’s a big blind-spot to accept. We want you to understand and act on all your search data. Concentrate ingests data from sources that most sites already have available (e.g Google Analytics, Omniture, Coremetrics, Hitwise, Compete, etc. ), enhances this data by finding common patterns and query types, and visualizes search phrases for exploration and analysis. Pattern identification to condense the long tail into keyword phrases with similar structures. 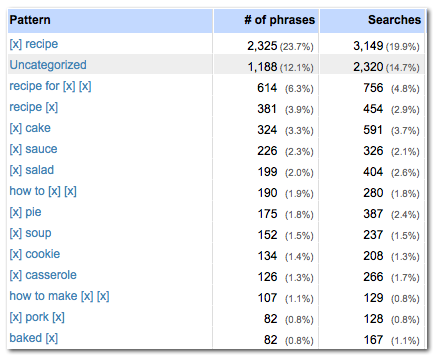 For example, here are some common search patterns from a cooking web site (the “[x]” represents a wildcard). 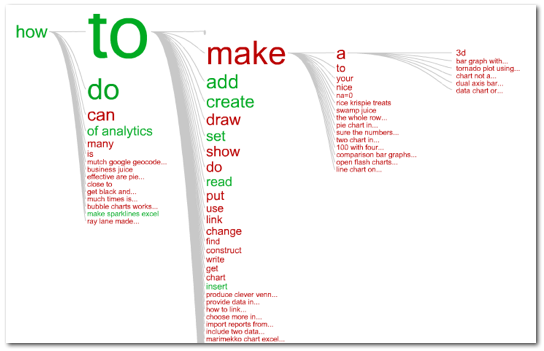 Keyword visualization to show the connections between keywords and the relative performance of phrases. This wordtree shows the frequency of words within phrases (size) and average time spent on site (color). Congratulations to Chris, Pete, and Sal for all their hard work, diligence, and creative problem solving to launch this solution.